Welcome to the 2017 BASF Innovations in the Field. This yearlong program is designed to showcase four progressive farmers and their use of technology and agronomic practices to enhance their return on investment and profit potential. Check back each week for new blogs and videos from the farmers as they share their experiences and crop management decisions throughout the growing season. Here is a brief overview of our four participants. Brothers Mike and Mitch House operate the farm as partners. Mike's son, Grant House; and Mike's son-in-law, Nick Roudebush, assist in the operation. Mitch and Mike started farming for their father in the 1980s and took over control of the family operation in 2011. House Farms has been operated by the family since 1869. The operation is a combination of owned and rented land that has grown to involve several thousand acres. 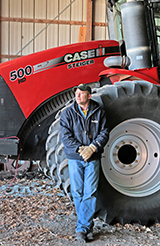 The House brothers operate a 50/50 corn and soybean rotation, and seed around 200 acres annually to soft red winter wheat that they double-crop with soybeans. Soybeans and wheat are grown for seed and wheat straw is sold to a local landscaper. They plan to set up on-farm trials in 2017 focused on soybean population, micronutrients in soybeans and in-furrow fungicide in corn. Ryan Farms consists of 4,500 no-till acres with a 50/50 crop rotation of dryland corn and soybeans and a small amount of alfalfa for their 80 purebred Simmental cows in a cow/calf operation. Soil types vary from silt loam to clay to gumbo on a very diverse terrain. A cereal rye cover crop is planted on 70% of the farm's acres to promote soil health and prevent erosion. Ryan farms in partnership with his grandfather Marty; father and mother Dave and Beth; uncle and aunt Jim and Julie; wife Krysti; two sisters Courtney and Kaitlyn; brother-in-law Andrew; son Cole; and two nephews and a niece Ryan, Nate and Eliza, respectively. 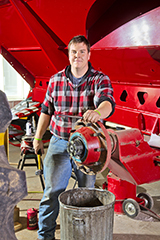 A graduate of Black Hawk College in 2007, Ryan, started farming full-time in 2009. The family operation began farming in the area in the late 1950s, including a piece of land that his ancestors homesteaded seven generations ago. Scott Wettstein farms in the southeastern part of the state with his older brother Brian, father Joe and mother Betty. A younger brother, Nick, helps with work, but has other interests at this time. His sister Jen is away from the farm. The Wettsteins raise several thousand acres of corn and soybeans, primarily in a 50/50 rotation. They are constantly testing products and practices on 40- to 80-acre fields, looking for the "next 20 bushels." Wettstein puts a lot of emphasis on communication with his family. He agrees with a statement he once read that, "Being in business with your family is the hardest job you will ever do, but the benefits are worth it." BASF Innovation Specialist Nick Foertsch describes the family as very progressive and not status quo. He says they have a "prove it to me" attitude. He goes on to say that when crop prices were at their peak, the family reinvested in farm infrastructure, to ready themselves for future growth. That included a new, faster grain unloading and storage facility and a new shop.